Chupetemania is a company specializing in the online sale of pacifiers, bottles and original custom made accessories for babies. 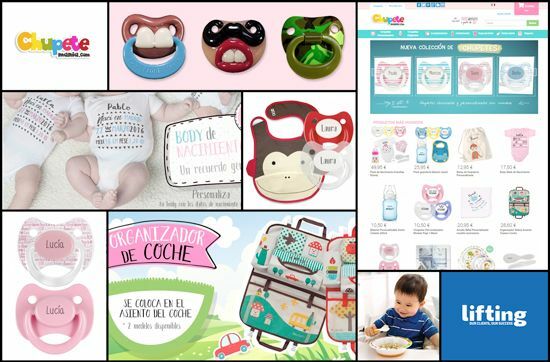 Chupetemania was founded with a very clear idea: each baby is unique and special, therefore they decide to base the business in the creation of custom made pacifiers. The custom made pacifiers are also fun and different, they serve to avoid the spreading of viruses amongst babies, given that the mouth is the principal route for the spreading of illnesses amongst babies. Therefore, custom made pacifiers have a clear competitive advantage to other brands in the same sector. Chupetemania is a business with ambition and a desire to grow in the market, motivated by not wanting to stay uniquely within the manufacturing of custom made pacifiers but want to design a collection of custom made products. All of their products are sold in Spain and Italy online, which guarantees a buying experienced which is simple and detail orientated, allowing for the maximum customization of the product. From Lifting Group we have developed an online business strategy, with the aim of increasing the sales of Chupetemania. With a strong presence in Italy, France and Spain, Chupetemania have succeeded in positioning themselves as one of the leading brands in their sector. At Lifting Group we work with the aim of increasing the visibility and recognition of the brand Chupetemania. For them, we designed a digital strategy to bring to the forefront Inbound and Outbound Marketing strategies, centered around increasing and reestablishing traffic to the website. Thanks to the dedication that Lifting Group have given to the project and each of the actions carried out, Chupetemania has doubled its invoices, based exclusively on strengthening its online presence. Increasing the online presence, visibility and fame of the brand. Increasing traffic to the brand’s website. Increasing the number of sales. Increase of 60% in organic traffic. Positions TOP1 and TOP3 for the main 10 kws to positionate. Increase of 240% in facturation. Increase of the visibility and brand presence in all the social media.